The Lifers feature the intertwined and, at times, ethereal voices of Liv and Anita Cazzola and an accompaniment that may start out quietly with softly plucked strings or an accordion swell before giving way to rip-roaring drums and soaring melodies. As songwriters, their stories juxtapose tenderness and explosive energy, sometimes within a single breath while exploring notions of home, family and community, and highlighting the beauty, vulnerability and power of nature. Their sophomore album “Honey Suite” is more personal than ever, reflecting on the fragility of life and our world, and touching on themes of place, sisterhood, mental health, and the environment. We caught up with Liv and Anita Cazzola at home in Guelph to chat about the new album. The Lifers will be touring the new album across Canada, the US and Europe this year – in Ontario with their thunderous six-piece band, and abroad with their collaborative project, alongside their Sisterhood of Sound tour with Guelph based singer-songwriter Annie Sumi. The Guelph CD Release show for “Honey Suite” takes place at Royal City Church on Wednesday May 16th with support from Annie Sumi. GET TICKETS. For information about all The Lifers shows, visit thelifersmusic.com. 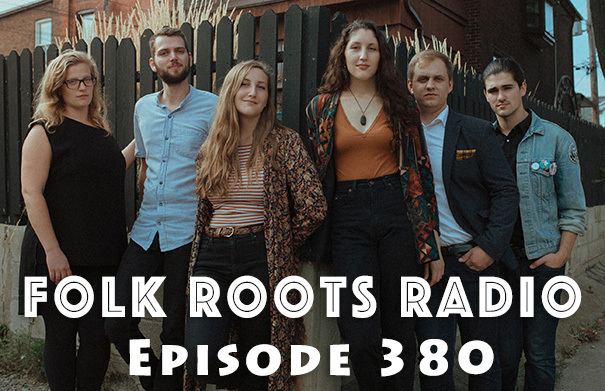 Notes about some of the new music on our radar that made it into Episode 380 of Folk Roots Radio. London ON singer-songwriter Carly Thomas has a new album out, “Versions”, a collection of original songs revisited. The new album was recorded at Second Records in St Thomas, with Denis Gauthier. Carly Thomas took home Contemporary Singer Songwriter at the 2018 Jack Richardson London Music Awards. Guelph storytelling singer-songwriter Doris Folkens is getting ready to release her self-titled debut which was produced by mando-maestro Andrew Collins. We just taped an interview with Doris Folkens which you can find on the website HERE. The Doris Folkens CD release show will take place in Guelph at The Common on Saturday May 26 2018 at 7 p.m. For more information about the music of Doris Folkens, visit dorisfolkens.com. Alyssa Sequoia’s “What Color Iz My Skin” is a song that came out of an improvisational jam at a studio in Manhattan (NYC). The comedian and singer-songwriter already had some lyrics for the song that reflected on a challenging health problem that meant she had to learn to walk again. New Brunswick’s Alicia Toner started out in musical theatre, before deciding to add the titles ‘recording artist’ and ‘songwriter’ to her repertoire with the release of her debut full-length album, “I Learned The Hard Way”. The title track was written by Canadian artists Donovan Woods and Stephanie Cadman, which according to Toner set the tone for the rest of the album. Stephanie Cadman introduced Toner to producer Stuart Cameron (from The Heartbroken), son of legendary Maritime musician/songwriter John Allan Cameron, who did much of the production on the album. The ‘Lioness of Lanark County’, Ali McCormick has just released her third album “That Place I Know”, her most personal album to date and the follow-up to 2016’s very well received “Clean Water”. The new album is full of road-tested songs that are rooted in stories from her life and experiences and featuring a cast of colourful characters. A true wilderness wordsmith, Ali McCormick grew up off grid, on a small holding where her family grew their own vegetables, and tended livestock. A rugged life – certainly, with its own fair share of hardship, but there were also the spring melts, maple syrup runs and sunlit days spent chasing deer out of the garden with an old hound dog. For Ali, there was the guitar too. Music fueled her dreams, which lead to her heading to the big city in her late teens, with her guitar in hand. Ali describes her songwriting style like her life – a patchwork quilt of personality, rural upbringing and a desire for the open road. Visit Ali McCormick online at alimccormick.com. Interview: Liv & Anita Cazzola from The Lifers discussing their sophomore album “Honey Suite”.